A rapid setting cement-based, flexible grouting compound for wall and floor tiling with joint widths from 3–15 mm. It has water repellent properties without the addition of an admix. The grout is weather resistant and can be used internally and externally on both wall and floor tiling, including swimming pools with non-aggressive water conditions. FLEX FL is especially suited for humid and damp locations, particularly showers and kitchens. For heavily trafficked areas where the grout will be subjected to high point loads, it is recommended that GK grout is used. Where cement based grouts are likely to be affected by aggressive conditions or where impervious or chemical resistant joints are required, ARDEX EG 8 Cement/Epoxy Hybrid Grout and Adhesive should be used. 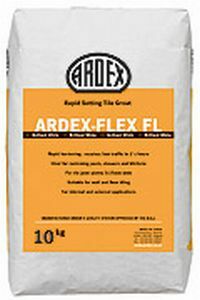 Available in 32 colours, refer to ARDEX data sheet. The product information below is from the NBS Plus library of product clauses offered in NBS specification products. It has been created by NBS for ARDEX UK Ltd. Each product clause is authored in NBS format and is intended for inclusion in project specifications. Please note that NBS product guidance is not a replacement for the manufacturer's literature and it is recommended that ARDEX UK Ltd be consulted before specifying.